Michael Eric Dyson is Professor of Sociology at Georgetown University. He is an author, a contributing opinion writer at the New York Times, an MSNBC political analyst, a contributing editor at New Republic, the host of the Michael Eric Dyson Podcast Featuring Dr. Dan Ratner, and an ordained Baptist minister for over 30 years. Dr. Dyson received his PhD from Princeton University in 1993. Dr. Dyson has authored nearly twenty books on subjects such as the legacy of Martin Luther King, Jr. in April 4, 1968, Malcolm X, Nas’s debut album Illmatic, Tupac, Marvin Gaye, and Hurricane Katrina’s devastating and long lasting effects. He has won two NAACP Image Awards for Outstanding Literary Work in Non-Fiction and the American Book Award in 2007 for Come Hell or High Water: Hurricane Katrina and the Color of Disaster. Essence has named Michael Eric Dyson one of the 40 most inspiring African Americans and Ebony has listed him among the 100 most influential black Americans. He often speaks at universities and political conventions, but he is also known for his speaking engagements at union halls, prisons, classrooms, and churches. Throughout his career, Dr. Dyson has had a profound effect on American culture and thinking. His latest book, What Truth Sounds Like, continues the conversation started in his 2017 bestseller Tears We Cannot Stop, and was the winner of the 2018 Southern Books Prize for nonfiction. Follow Michael Eric Dyson on Twitter and Facebook. Fifty years ago Malcolm X told a white woman who asked what she could do for the cause, "Nothing." Dyson believes he was wrong. In Tears We Cannot Stop, he responds to that question. If we are to make real racial progress, we must face difficult truths, including being honest about how black grievance has been ignored, dismissed or discounted. Race, Racism, & Race Relations In America Through research and personal experience, Michael Eric Dyson explores the past and present relationships of race, racism, and race relations in America. In Caricature: Racial Profiling & Its Impact On Black America Although America has made strides towards equality amongst varying ethnic groups, there are still disparities. Reminders of this reality and the stereotypes they perpetuate are constant. Dr. Dyson discusses racial profiling, its impact on minority communities, responses to profiling, and the rights afforded people of different ethnic backgrounds. Sociology of Hip-Hop: Jay-Z How is hip-hop influenced by communities and how do communities influence hip-hop? Michael Eric Dyson takes a look at the work of Jay-Z and the impact of that work. The Black Presidency Dr. Dyson takes a close look at the meaning of America’s first black presidency and the way the politics of race have shaped Barack Obama both inside and outside the Oval Office. What Have We Come To? Wars Between The Generations It's no secret that generational divides create tension between age groups. How do different generations relate the past to the present and does it affect their vision of the future? African American Influence On Pop Culture Dating back decades, African American culture has influenced pop culture. However, this influence is often not attributed to the community that created it, leading to appropriation. Dr. Dyson traces African American influence on popular culture through the years. Dr. King For The 21st Century Dr. Dyson examines the leadership of Dr. Martin Luther King, Jr. and how his leadership and message is used in the 21st century. Come Hell Or High Water: Hurricane Katrina & The Color Of Disaster Like the book of the same name, this speech is about Hurricane Katrina, New Orleans, relief efforts, and the demographics of those impacted by Katrina in 2005 and the years following. The Tears We Cannot Stop won the 2018 Southern Book Prize for Nonfiction. Watch Michael Eric Dyson speak on the national anthem protest, Kanye West’s controversial comments, and more on The View. 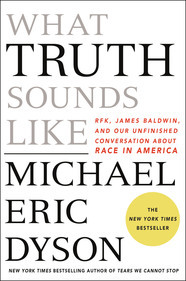 Read an excerpt of Michael Eric Dyson’s new book, What Truth Sounds Like, on ABC News. Listen to Michael Eric Dyson on WNYC’s Brian Lehrer Show. Watch Michael Eric Dyson on MSNBC’s Morning Joe. Listen to Michael Eric Dyson on Slate‘s The Gist podcast. Read Michael Eric Dyson’s op-ed on Charlottesville in the New York Times. Check out the official Michael Eric Dyson website. Read the Washington Post review of Tears We Cannot Stop. Watch Michael Eric Dyson’s appearance of The Breakfast Club. Read “How Black America Saw Obama” by Michael Eric Dyson. Follow Michael Eric Dyson on Twitter. Listen to On Point’s interview with Michael Eric Dyson. Read three excerpts from Tears We Cannot Stop. Read the Mother Jones interview with Michael Eric Dyson. Bustle names Tears We Cannot Stop the most anticipated nonfiction book of 2017. Watch Michael Eric Dyson’s appearance on Fox News. Read the NYT op-ed piece that sparked a national debate. Listen to the Michael Eric Dyson Podcast Featuring Dr. Dan Ratner. Read “Love and Terror in the Black Church” by Michael Eric Dyson for the NYT. Read “America’s Blue Wall of Terror” by Michael Eric Dyson for New Republic. Watch Michael Eric Dyson on The Raw Word. 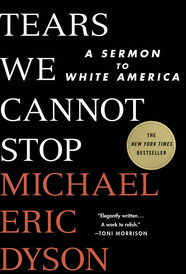 Praise for Tears We Cannot Stop and Michael Eric Dyson "Elegantly written, Tears We Cannot Stop is powerful in several areas: moving personal recollections; profound cultural analysis; and guidance for moral redemption. A work to relish." "Here’s a sermon that’s as fierce as it is lucid. It shook me up, but in a good way. This is how it works if you’re black in America, this is what happens, and this is how it feels. If you’re black, you’ll feel a spark of recognition in every paragraph. If you’re white, Dyson tells you what you need to know—what this white man needed to know, at least. This is a major achievement. I read it and said amen."